Growing up Disney’s princesses where the protagonists of my favourite movies - The leftish friends of my mother, however, couldn’t believe I’d like those things, they said that as long as I’m into those kind of characters I wouldn’t never be empowered or independent and I’d most likely develop, sooner or later, an eating disorder. I was very small and didn’t really had toys or films of my own, so my mother’s friend promised to buy me The Sleeping Beauty VHS if I could convince him that Disney Princesses would make good role models. Armando coughed, wrinkled his nose and lifted his shoulder in a half shrug. I’m aware that it is very unoriginal, but what can I do? I’m a Disney girl. 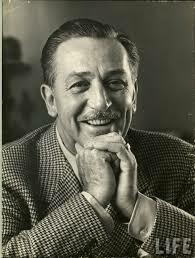 Walt Disney was a dreamer, an artist, an entrepreneur, an innovator, a wonderful leader who grew personal relationships with his employees based on trust and confidence, and a cheerful man who cared nothing for money - so much that he never really touched it. His brother Roy was the one to handle finances; he and Walt would gamble nearly every single coin, jewel or good they owned in order to make breakthrough movies and, eventually, a theme park. Wide aware that money came and went, Walt, his wife, Lillian, and their two children lived modestly in a three-bedroom house and rarely ever socialized with other Hollywood moguls. For me, he and his legacy radiate art at the level of Salvador Dali and Picasso - and now, I’ll try to show you why. Fantasia was released in 1940 as Disney’s third (and most venturesome) film, it was considered to be his absolute masterpiece yet it failed to make a profit due to World War II. Today the two-hour-long movie is ranked as the best animation movie in the history of United States as well as part of the top 50 of best films in the history of the same country along with number 48 in IMDb’s list “Movies That Everyone Should See At Least Once”.